An old pocket watch provides a link to the past. In the kitchen of her Haverford hone, Constance Bookbinder holds her father's pocket watch that connects her to the 1937 Hindenburg zeppelin disaster. On the wall behind her are framed photos of celebrities from now-closed Bookbinder's 15th Street restaurant in Philadelphia. Her story opens with an 80-year-old pocket watch wrapped in mystery and linked to an infamous disaster. That story flows through the fracture of a famous Philadelphia family, and soon may continue in a Center City retirement home. The pocket watch, which Constance Bookbinder, 81, is holding in her hand, is engraved with a name famous like her own — Graf Zeppelin. It belonged to her father, Louis F. Cunningham, who was director of public relations for Atlantic City for decades before and after World War II. Her dad told her that he happened to be at Lakehurst, N.J.. that fateful day in May 1937, and witnessed history — the explosion and crash of the world’s fastest zeppelin, the Hindenburg, that killed 36 people. WLS radio reporter Herbert Morrison’s legendary broadcast, including the words, “Oh, the humanity!”, told the world what had happened. Constance believes her father was given the watch as a souvenir before the crash. The front shows a zeppelin superimposed over a globe. The reverse is engraved to commemorate two “trail blazers” — the Graf Zeppelin, which went around the world in 1929, and the 16th century explorer Magellan. 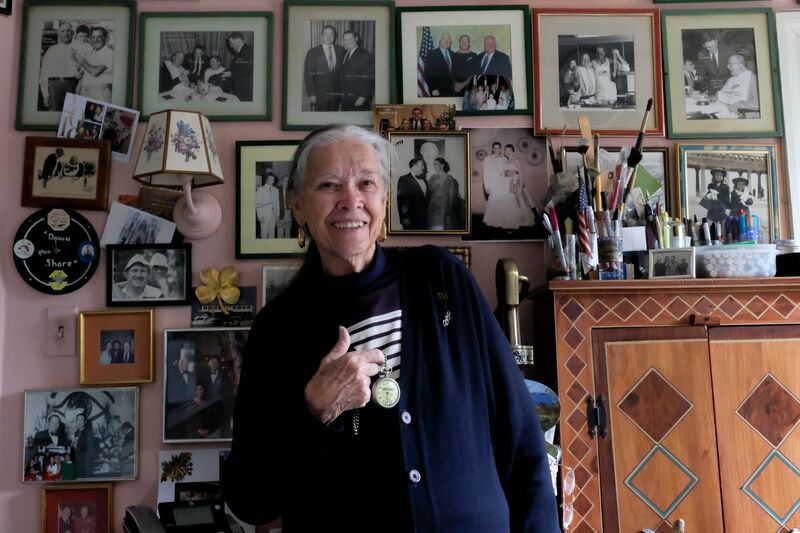 In her Haverford home, Constance Bookbinder holds the pocket watch that connects her to the 1937 Hindenburg disaster. When Constance found the striking timepiece in a drawer in her Haverford home, she wondered what it might be worth and what she might do with it. She is not looking for money; she wants to place it where it will be appreciated. Constance called me for help, and I went to her home, where she has lived since her husband’s death about a dozen years ago. She is not happy rattling around in the four-bedroom condo, and wants to live in Center City. As soon as she can sell the condo, “I’m going to a retirement home right across from the cathedral,” she tells me. After college, she moved to New York. “I had a job at Young & Rubicam, the second-largest ad agency in the world. I had a date every night,” she says, without bragging. In 1960, she married Samuel C. Bookbinder, of the restaurant family, who brought her to Philadelphia. She was 23. They had two boys and a girl, and once the children were in school, Constance became a model at John Wanamaker across from City Hall, doing what we today call greeting. Using her model voice, she says to me, “Good afternoon, sir. Today we are having a sale of Omar ties in the men’s department.” She smiles warmly. “They kept me for 30 years,” she says, and you know they were happy years. Sam’s Jewish father — known as “Murph” — married a Catholic woman. Sam was raised Catholic and married Constance at St. Patrick’s Cathedral in New York City. Because of religious intolerance in the family, Murph was exiled from the original Bookbinder’s restaurant at 125 Walnut St. in Old City, Constance tells me. He retaliated by opening Bookbinder’s Seafood House at 215 S. 15th St. in Center City in 1935, sealing the schism in the family. The business at 125 Walnut was bought in 1945 by John M. Taxin, whose family owned it until it closed in 2009. Constance’s husband remained connected with the 15th Street restaurant until his death. It closed in 2004. Doing online research, I learned that her Graf Zeppelin timepiece is part of a series of watches that promoted the German dirigibles. They sell for between $200 and $1,200 depending on condition. Sailing ships decorate the pocket watch that Constance Bookbinder believes her father received in 1937 on the same day he witnessed the Hindenburg zeppelin disaster in Lakehurst, N.J. I called the National Air and Space Museum in D.C. and the Franklin Institute to ask if either had any interest in the pocket watch. The Air and Space Museum says it wants only “unique” items, and the institute, which displays both aeronautics and watches, was not interested. When Constance goes to her Center City retirement home, it looks like the watch will be going with her.